A couple weeks ago, one of my coworkers found a dollar bill on the floor, and not knowing whose it was put it on my stand-up desk (aka the file cabinet next to my desk). It sat there for a couple of days, eliciting questions, but no action. 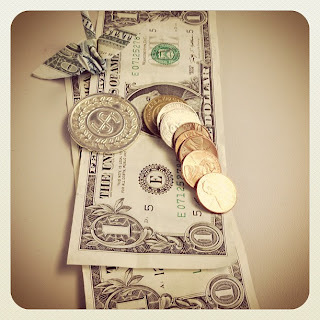 After a week, mysteriously the dollar had gained some friends in the form of five pennies, two nickels, a Chuck-e-cheese token, and a highly dubious coin simply decorated with laurels and a $, and made from cheap plastic. 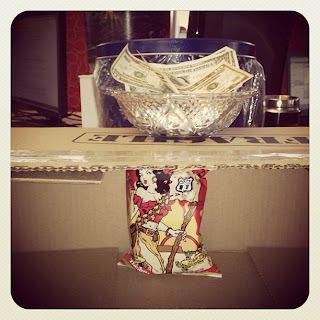 Then another coworker lost a bet and added the $1 pot to the ...uhm.. pot. 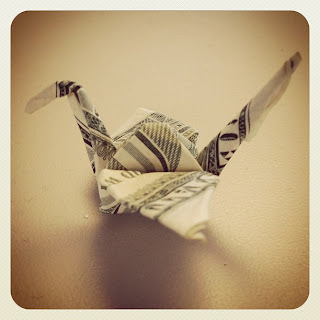 Last week an origami dollar bird appeared. Current total value: $3.15, plus a game of skee ball. All sitting out in the open, ready for the taking. Yet, no. The money is gone. Budget-constraints in the snack department caused a reallocation of funding to Mama Zuma and her followers. Instantly additional funding magically appeared; the money is now gone. I blame hunger and masochistic tendencies (if you've tasted Mama's chips you'll know what I mean) more so than greed.